The demographic and quantitative genetic aspects of consanguineous marriages are reviewed before epidemiologic principles are applied. Consanguineous unions range from cousin-cousin to more distant relatedness, and their prevalence varies by culture. The prevalence is highest in Arab countries. They are most common in groups that are poorly educated, have low socioeconomic status and are conservative, but they are declining with modernization. The prevalence rate of consanguineous marriages in the kingdom of Saudi Arabiais51.3% with an average inbreeding coefficient of 0.02265, which is high compared with many other countries. The most important variables affecting inbreeding are the regional background of the family (p<0.001) and the level of education, which is inversely associated with consanguineous marriage (p<0.001). The difference in perinatal and postnatal mortalities between consanguineous and non-consanguineous families is not significant. Consanguinity is measured by geneticists using the inbreeding coefficient, the mean consanguinity of a population, and the concept of genetic load. Recessive genes may be deleterious or beneficial if heterozygous in local conditions. Bayesian statistics can predict, by the coefficient of increase, the probability of diseases in an offspring as a function of consanguinity and disease characteristics. Inbreeding generally increases pre-reproductive mortality. Crude mortality increases with inbreeding in proportion to the mortality rate. Morbidity increases significantly with inbreeding in many diseases studies in many countries. Epidemiologic studies usually measure the effects of inbreeding in terms of genetic load, which is not readily translatable into morbidity and mortality. Family study and other methodological study design problems will be used to implement this study. Confounding is the most difficult problem in such studies, because of the difficulty in selecting non-inbred controls. This study will help to understand and develop a better consultation and education for patient and his/her family and their community. The study population comprises patients and families with a history of genetic disease, which was clinically identified or referred to genetic services by the following departments: Women Health, Pediatric, and Internal medicine. Patients’ medical information were obtained, including information regarding some significant factors that might increase the frequencies of genetic disease caused by consanguineous marriages, the effect of the level of relationship and severity of disease, and any other factor that might enhance genetic case management and counseling (Table 1). The medical files and/or departmental database of patients were accessed to extract this medical information required for the genetic epidemiology statistical analyses (Table 1). Ethical approval for all studies was awarded by the King Fahad Medical City Research Ethics Committee. Questions were drawn from factors with significant effects on heredity of genetic disease reported from previous studies and genetic knowledge. During the data collection process, the interests of all parties were considered and balanced throughout the process, in consultation with bioethics advisors. Through pilot testing with cognitive interview techniques, the wording of certain questions was refined, and other questions were added or deleted to improve the length and overall flow of the questionnaire. The variables measured four broad domains: personal data (for example, ages of both parents, type of marriage, and premarital examination); personal health (for example, family medical history and medical genetic status); level of education; and social status (for example, personal income). This cross-sectional study was conducted in Al-Kharj city (80km from Riyadh). The aim of this study is to determine the association between consanguinity and disease mortality and morbidity among families who live in Al-Kharj and the surrounded cities, this include King Fahad Medical City in Riyadh and King Khalid Hospital in AL-Kharj. Bioinformatics is the application of computer technology to the management of biological information. Computers are used to gather, store, analyze and integrate biological and genetic information, which can then be applied to gene-based drug discovery and development. The need for bioinformatics capabilities is clearly shown by the explosion of publicly available genomic information, resulting from the Human Genome Project. Investigate the prevalence of consanguineous marriages. Examine the frequency of consanguineous marriages in United Arab Emirates. Examine the frequency of consanguineous marriages in the state of Qatar. The relationship between consanguinity and the risk of PID. Examine the frequency of consanguineous marriages among different districts in Pakistan. There are a lot of publications about consanguinity. The authors compete to cover all aspects of this subject. A search for previous studies from PubMed was carried out, using several keywords (consanguinity, prevalence, association, Gulf countries, morbidity, and mortality), which yielded 20 articles focused on the prevalence of consanguineous marriages in the Middle East region, especially in gulf countries, because they, in general, share the same customs of marriages with the kingdom of Saudi Arabia and experience the same effects of consanguineous unions on the offspring (Table 3). In this population study that is focused on patients and families with diagnosed genetic diseases, data were collected from the relevant medical records in coordination with the doctors, who are working in different hospitals located in the city of Al-Kharj. According to the surveys performed by previous studies, the most significant factors that influence our hypothesis were identified, and the list contains factors such as level of relationship, gender, level of education, age and economical class. Inbreeding is a social custom handed down through the eastern communities under different justifications, but the development of medicine in the modern era has shown the consequences of this type of marriage, because of its transmission of serious diseases that pose a threat to the lives of newborns. into consideration graphic differences of the country. Saudi Arabia is among the countries of the world with high rate of consanguinity, especially among first cousins. relationship between the female and her spouse. Change in the level of consanguinity from 41.8% to 54.5% in one generation only. and PID including performance status and risk of death. There is correlation between consanguinity and development of PID. among the population of Oman. 20.4% of all marriages are contracted among specific tribal grouping which is common behavior in Oman. Examine the rate of consanguinity and inbreeding coefficient. Consanguineous marriages are common among women who had a primary level of education. These diseases have become a medical phenomenon and have drawn the attention of researchers in specialized universities and medical centers in many countries. The studies that were conducted dealt with the subject from different angles, and the sizes of these studies reflect the importance of this phenomenon. It can be inferred from these studies that there are high levels of inbreeding in Pakistan and the Gulf states, as shown in Table 1. Most of these studies focused on inbreeding among individuals who live in the abovementioned countries, and they show that inbreeding spreads the impact of diseases such as thalassemia (trait and disease), sickle cell anemia (trait and disease) and G6PD. Many studies, which focused on patients and families of populations that have been diagnosed with genetic diseases, also highlighted the consequences of inbreeding in the Middle East, especially the Gulf countries. The findings and conclusions are evident, as shown in Table 3. 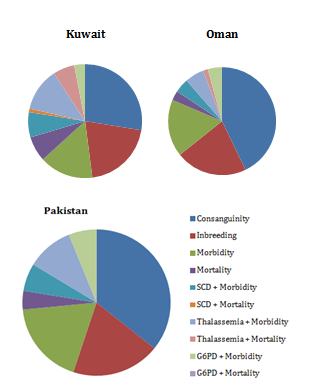 Finally, it was found that the size of the studies conducted in the Gulf countries and Pakistan on this phenomenon, described in Table 4, is a powerful and descriptive indication of the importance and seriousness of inbreeding and the consequent spread of genetic diseases (Figure 1) (Figure 2). Figure 1 Geographical location colored according to inbreed cutoffs. Figure 2 A comparison of the prevalence of consanguineous marriages between Muslims countries shows a difference in percentage from one country to another. This study aims to identify the frequencies of genetic diseases caused by consanguineous marriages and investigate the role of relationship level between couples and its impact on the severity of diseases. It also determined the effect of consanguinity on mortality and morbidity and found that there are factors that could be useful to manage genetic cases and genetic counseling. Further, this study found effective solutions to control the prevalence of this phenomenon, in order to prevent increase in the ratio of consanguinity. The results will serve as evidence to convince people who do not take this topic seriously and enlighten those who do not have sufficient knowledge about the influence of consanguinity on their health. This study will help to enhance understanding, develop a better consultation strategy and highlight the importance of education, so as to increase the effort of enlightening the population and answering related questions concerning consanguinity. The survey was designed based on significant heredity factors of genetic diseases obtained from literature review and was divided into four categories: personal data, personal health, level of education and social status. Patients and families with previous history of been diagnosed with genetic disease are targeted in this study. The survey covers different aspects, such as the type of inherited disease and if other siblings havethe same type of disease, age of both parents especially the age of the mother, type of marriage (consanguineous or non-consanguineous), relationship degree of parents (first cousins, second cousins, third cousins), and personal income. This information was obtained by accessing patients’ files or departmental database. Several challenges were encountered in the course of this study. King Khalid Hospital in Al-Kharj city was contacted but they couldn’t help because they did not have a genetic unit, and all cases were transported to central hospitals in Riyadh city without assigning serial numbers, so they couldn’t be followed. After a number of visits to the center of research at King Fahad Medical City in Riyadh, they expressed their willingness to participate in this study. Since, the approval for the research arrived quite late, the allocated time could not be spent on the survey to accomplish the goals, as planned. However, a plan was proposed that would allow the performance of a comprehensive follow-up study. Multiple visits were then carried out to a number of different hospitals, including King Faisal Specialist Hospital & Research Centre, king Saud Hospital, and king Khalid University Hospital, with the permission of the hospital authorities. Premarital screening and tests for particular diseases, including thalassemia, sickle cell anemia, G6PD, and hepatitis, are mandatory procedures recommended by the health ministry in Saudi Arabia before marriage. These tests have been chosen based on previous studies that measured the most common inherited diseases in the area. Possibly, in the next decades, the list of premarital screening will increase if the effects of genetic factors that cause-inherited diseases are not controlled and if attempts are not made to decrease the prevalence ratio of inherited diseases. Hemoglobinopathies constitutes a big part of premarital screening. They are important because of their relationship with consanguinity, and the ratio of prevalence in the area is high. It is important to focus on the prevalence ratio of Hemoglobinopathies as a trait not a disease with respect to sickle cell anemia, thalassemia, and G6PD. This is a good idea to control the ratio and decrease the prevalence through development of genetic consultation. Saudi Arabia is among the counties of the world with high rate of consanguinity (57.7%) 2. Qatar and United Arab Emirates experienced a big change in consanguinity rate in one-generation only. This indicates that people who live there are not aware of the effects of consanguinity. Pakistan is not a gulf country, but it shares the same factors with the gulf countries, such as the high prevalence rate of consanguinity (60%) 8 and the fact that consanguineous marriages are more common in women who had a primary level of education. (20.4) 15% of all marriages are contracted among specific tribal grouping, which is common behavior in Oman, also a gulf country. All the above information supports the factors that will build up the hypothesis and the aims of study (Table 3). Consanguineous marriage is clearly a continuous phenomenon. It may be impossible to stop this behavior. However, the prevalence rate of these diseases can be decreased by increasing awareness about the side effects of consanguineous unions on health, especially among regions, cities, and groups of people known to have this custom. Also, genetic consultancy plays a very critical role in the improvement of the general understanding of this important issue. This study experienced some limitations and challenges. As mentioned before, since a genetic unit was not available at King Khalid hospital in Al-Kharj city or at least a good recording system for the cases was not available, the plan to conduct a cross-sectional study on Al-Kharj population and the surrounding area only was canceled. An additional step was taken and other hospitals with genetic units were visited to accomplish the survey. Another limitation is that some good studies are available as abstract only; payment is required to get access to the whole study. Also, the key words posed a challenge in the preparation of the study and writing the introduction. Finding good studies matching the key words was not easy, because the study is an epidemiological study and the number of related articles is few in the country. Time was another challenge/limitation, since sixteen weeks is insufficient to read, write an introduction, design and accomplish the survey, and conduct statistical analysis of the results. In spite of these few limitations and challenges, the purpose of the study was not greatly affected. The high rate of consanguineous marriages in Saudi Arabia affects public health, which in turn increases the occurrence of genetic mutation. There is an urgent need to study it and come up with measures to control it in an acceptable manner. Al Husain M, al Bunyan M. Consanguious marriages in a Saudi population and the effect of inbreeding on prenatal and postnatal mortality. Ann Trop Paediatr. 1997;17(2):155‒160. Mohsen A F El Hazmi, A R Al swaliem, A S Warsey, et al. Consanguinity among Saudi Arabian population. J Med Genet. 1995;32(8):623‒626. Bittles A. Consanguinity and its relevance to clinical genetics. Clin Genet. 2001;60(2):89‒98. Barrai I, cavalla-sforza LL, Moroni A. The prediction of consanguineous marriages and mating structure of the population. Jpn J Genet. 1969;44:230. Lyons EJ, Frodsham AJ, Zhang L, et al. Consanguinity and susceptibility to infectious diseases in humans. Biol Lett. 2009;5(4):574‒576. Al-abdulkareem AA, Ballal SG. Consanguineous marriages in an urban area of Saudi Arabia: rates and adverse health effects on the offspring. J community health. 1998;23(1):75‒83. Bener A, Dafeeah EE, Samson N. Does consanguinity increase the risk of schizophrenia? Study based on primary health care centrevisits. Ment Health Fam Med. 2012;9(4):241‒248. Hussain R, Bittles AH. The prevalence and demographic characteristics of consanguineous marriages in Pakistan. J Biosoc Sci. 1998;30(2):261‒275. Al-gazali LI, benerA, Abdulrazzaq YM, et al. Consanguineous Marriages in The United Arab Emirates. J Biosoc Sci. 1997;29(4):491‒497. Al-Hussein M, Al-Bunyan M. Rate of consanguineous marriagesin Saudi population. Symposium on Medical Genetic in the setting of the Middle Eastern population. Riyadh, Saudi Arabia; 1993. Shieh JT, Bittles AH, Hudgins L. Consanguinity and the risk of Congenital Heart Disease. Am J Med genet. 2012;158A(5):1236‒1241. Roberts DF. Consanguinity and multiple sclerosis in Orkney. Genet Epidemiol. 1995;8(3):147‒151. Al-herz W, Naguib KK, Notarangelo LD, et al. Parental consanguinity and the risk of primary immunodeficiency disorders: report from the Kuwait national primary immunodeficiency disorders registry. Int Arch Allergy immunl. 2011;154(1):76‒80. Rajab A, Patton MA A. study of consanguinity in the Sultanate of Oman. Ann Hum Biol. 2000;27(3):321‒326. El-Tayeben, Yaqoop M, Abdur-Rahim K, et al. Prevalence of beta-thalassaemia and sickle cell traits in premarital screening in Al-Qassim, Saudi Arabia. Genet couns. 2008;19(2):211‒218. Al-suliman A. Prevalence of beta-thalassemia trait in premarital screening in Al-Hassa, Saudi Arabia. Ann Saudi Med. 2006;26(1):14‒16. Alharbi KK, Khan IA. Prevalence of glucose-6-phosphate dehydrogenase deficiency and the role of the A- variant in a Saudi population. J Int Med Res. 2011;42(5):1161‒1167. AljounSK, Jarullah J, Azhar E, et al. Molecular characterization of glucose-6-phosphate dehydrogenase deficiency in Jeddah, Kingdom of Saudi Arabia. BMC research note. 2011;4:436. Alhamdan NA, Almazrou YY, Alswaidi FM, et al. Premarital screening for thalassemia and sickle cell disease in Saudi Arabia. Genet med. 2007;9(6):372‒377. Al-RiYami AA, Suleiman AJ, Afifi M, et al. A community-based study of common hereditary blood disorders in Oman. East Mediterr Health J. 2001;7(6):1004‒1011. Ghani R, Manji MA, Ahmed N. Hemoglobinopathies among five major ethnic groups in Karachi, Pakistan. Southeast Asian J Trop Med Public Health. 2002;33(4):855‒861. Hashmi NK, Moiz B, Nusrat M, et al. Chromatographic analysis of Hb S for the diagnosis of various sickle cell disorders in Pakistan. Ann Hematol. 2008;87(8):639‒645. Barakat-Hadead C. Prevalence of high blood pressure, heart disease, thalassemia, sickle-cell anemia, and iron-deficiency anemia among the UAE adolescent population. J Environ Public Health. 2013;2013:680631. Alhosani H, Salah M, Osman HM, et al. Incidence of haemoglobinopathies detected through neonatal screening in the United Arab Emirates. East Mediterr Health J. 2005;11(3):300‒307. Marouf R, D souza TM, Adekile AD. Hemoglobin electrophoresis and hemoglobinopathies in Kuwait. Med Princ Pract. 2002;11(1):38‒41. Mann Prem S. Introductory Statistics. 2nd ed. USA: John Wiley & Sons; 1995. 750p. Dodge Y. The Oxford Dictionary of Statistical Terms. USA: Oxford University Press; 2003;23(11):1824‒1825. Trochim William M. Descriptive statistics. Research Methods Knowledge Base. 2006. ©2018 Abdulhadi. This is an open access article distributed under the terms of the Creative Commons Attribution License , which permits unrestricted use, distribution, and build upon your work non-commercially.